Remember that time (like, last week) when I suggested Rihanna was slowly embarking on an Amazon-like takeover of our lives? Well, we might as well just sign our estates over to the megastar now, because while we were awaiting new music, word in these fashion streets is that Rih is readying a line with international luxury goods conglomerate LVMH (also known as LVMH Moët Hennessy Louis Vuitton SE). Sidebar: Our FOMO is way too real right now. What folks did notice? Rih was wearing a pair of oversized, gold-plated sunglasses mysteriously branded with the “Fenty” logo. Cue the intrigue. So, what would a Fenty luxury fashion line look like? And are we ever going to get a new album? According to WWD, a source says the multitasking mogul may be planning a dual launch. “It is understood her collection with LVMH will span ready-to-wear, leather goods and accessories, and could be released in tandem with her ninth album, expected out sometime later this year,” they reported. 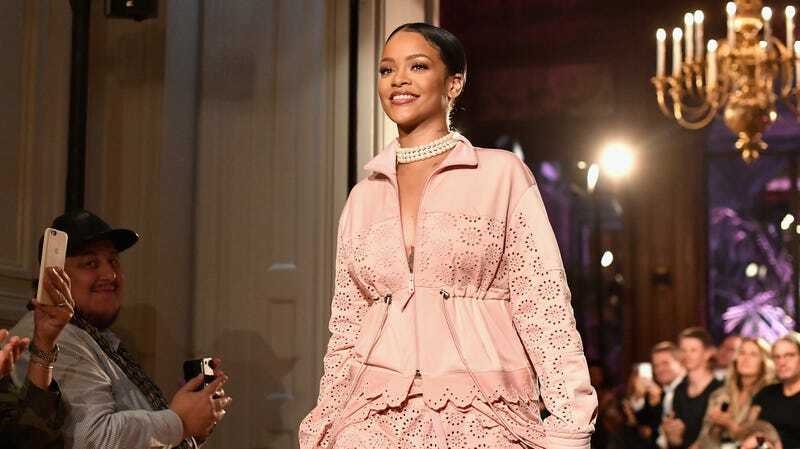 As for the look, if Rih’s New York style is any indication, it will include high-end, but incredibly wearable separates with a decidedly rock-and-roll edge—but even Rihanna’s low-key looks come at a luxury level price-point. Of course, Rihanna is far from the first entertainer to launch a luxury clothing line; former Spice Girl Victoria Beckham is now an award-winning designer for her eponymous label, and child stars Mary-Kate and Ashley Olsen have not one, but two successful high-end lines in Elizabeth and James and The Row. If the incredible success of Rihanna’s ongoing music career, Fenty Beauty and lower-priced fashion lines are any indication, her newest venture may be one for the record books.